Genus Mycetophyllia Milne Edwards and Haime 1848. Flat colonies with outward radiating valleys. Poorly developed columellae. Septa-costae are outward facing. Found in the Caribbean only. 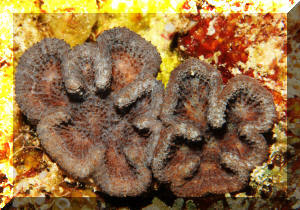 Mycetophyllia aliciae, Knobby Cactus, Thin Fungus Coral. 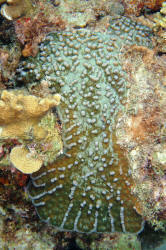 Usually found as thin convex plates, with distinctive raised star-shaped polyps. 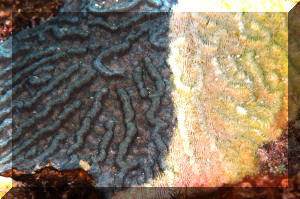 Bordered by ridges that run inward, though less pronounced, common than others of the genus in the region. Bahamas pix. Mycetophyllia danaana, Low Ridge Cactus Coral. Colonies as flat plates, mounds, domes. Ridges about edge turn to the inside, often crossing center, intertwine (definitive differences from M. lamarckiana in the same area). Occurs in green, brown, gray. Six to fifteen inches across. Bahamas pix. Mycetophyllia ferox Wells 1973. 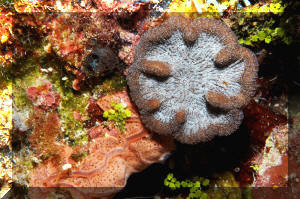 Colonies mainly as rounded plates, knobbed corallites, and covered with sinuous valleys/mazes that at times form closed borders (only member of the genus that forms such closed valleys). Bahamas images. Mycetophyllia lamarckiana, Ridged Cactus, Large Cactus, Fungus Coral. Colonies as flat, wavy-edged plates. Ridges fleshy, don't extend to centers, and don't interconnect. Wide, shallow valleys, usually fleshy. Color variable: browns, greens, grays. 6-12 inches in diameter. Bahamas pix.